Old Shoe buried in Willersey Cemetery Wall. 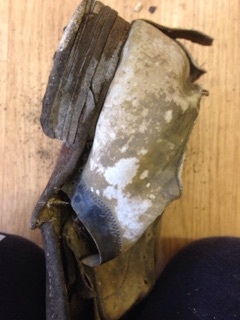 Old Shoe discovered buried in Willersey cemetery wall. 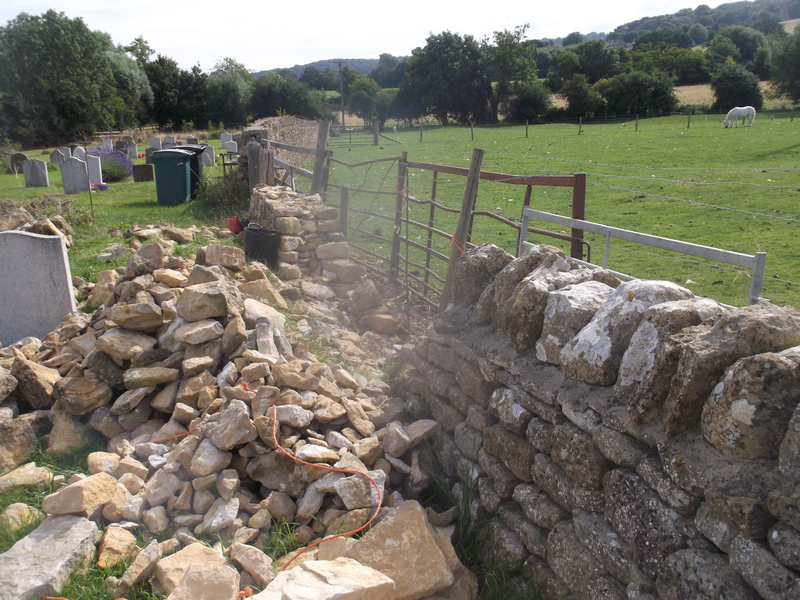 Willersey Parish Council recently had our cemetery dry stone wall repaired. A shoe was found in it. The wall bisects a ridge & furrow field and the cemetery. These comments below are from the Northampton Museum. Northampton has been the centre of UK shoe making for almost 900 years. The plentiful supply of oak bark and water for tanning, abundant supply of leather from local cattle markets and a central location for trading links has made Northamptonshire the perfect place for shoemaking to flourish. It's only part of the shoe. It is a man's white leather/white washed leather Oxford style shoe. 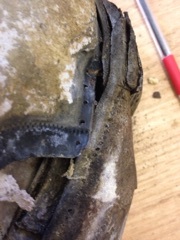 An Oxford is when the area by the eyelets is sewn into the shoe. A Derby style is when this area is not sewn in and so you can put your fingers underneath. It has a leather sole and an average height stacked heel. It has a very clearly seen backstrap. Given the colour of the shoe it could be one that was worn for sports as they were often white or white-washed white for wear. It's difficult to date but I would say possibly 1920s or thereabouts. There is a concealed shoe index at the museum in Northampton. At the moment the index stands at approximately 2,000 entries from all over the UK and also records concealed shoe finds in North America, Canada, and a number of countries in Europe including France, Spain and Poland. The overwhelming majority have been worn, and many have been repaired. Most finds are of single shoes, about half of them belonging to children. Independent researcher Brian Hoggard has observed that the locations in which these shoes are typically found – in chimneys, under floors, above ceilings, around doors and windows, in the roof – suggest that some may have been concealed as magical charms to protect the occupants of the building against evil influences. Others may have been intended to bestow fertility on a female member of the household, or been an offering to a household deity. A shoe is the only item of clothing which takes on the shape of the person wearing it. A single worn shoe was hidden so that a malevolent spirit could not steal it and take away the protection the shoe gave. 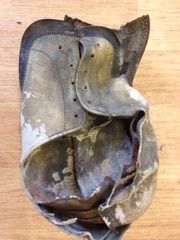 Concealed shoes have been found in many types of building, including country houses, public houses, a Benedictine monastery and a Baptist church. The earliest yet reported was discovered behind the choirstalls in Winchester Cathedral, which were installed in 1308.The custom of concealing shoes in the structure of a building appears to have more or less died out some time during the 20th century.